His grandmother, Egan Oh, was an elegant and imperious lady who was more traditional in her ways. Though she was the disciplinarian of the household, she also had her gentle side, which often showed whenever she would recount fascinating stories from her youth. “She was the most sought-after debutante of her day, admired for her beauty and distinctive style,” says Kevin. “Each time she left her house in Newton, there would be a cluster of male admirers waiting by the gates, who would run after her car, trying to throw roses and love letters through the window.” It was she who would instill in her grandson a sense of self-respect and pride in his Chinese roots. Because Kevin lived with them from the day he was born to the day he moved to the United States, he remained very close to his grandparents. Like the Young, T’sien, and Shang families in the books, the Kwans had their own customs. Kevin distinctly recalls how each year, their household would be buzzing with activity when it was time to make zhong—sticky rice dumplings stuffed with various fillings wrapped in bamboo leaves—for Dragon Boat Festival season. The gardeners would hack down leaves from the bamboo hedges and soak them in water. The cooks w ould then prepare huge vats of glutinous rice and different fillings—some sweet, some savoury—and the marathon dumpling wrapping sessions would begin. By the end of the week, the Kwans would be distributing the treats to relatives and friends. “It was a very Huck Finn kind of life,” says the author of his childhood. When not in school (he went to the Anglo-Chinese School [ACS] on Barker Road), he could be found whiling his time away outdoors, biking around the neighbourhood with his gang of friends. At that age, he did not have a concrete idea of what luxury was. “I grew up in an old house filled with old furniture, and I was afraid of going downstairs after dark because everything seemed creepy,” he adds. “Of course, being a young kid back then, I had no appreciation for my grandparents’ custom-made Huan Pao Fang pieces. I was envious of my friends who lived in high-rise apartments, not because they were wealthy but because I found them cool—they had lifts, wall-to-wall carpeting, and garages filled with vintage Rolls Royces and exotic sports cars. One estate even had an airplane hangar in the garden!” He only began to recognise his own privilege after they left for the United States, where his world became one of suburban neighbourhoods, smaller homes, no household help, and certainly no airplanes in the backyards. 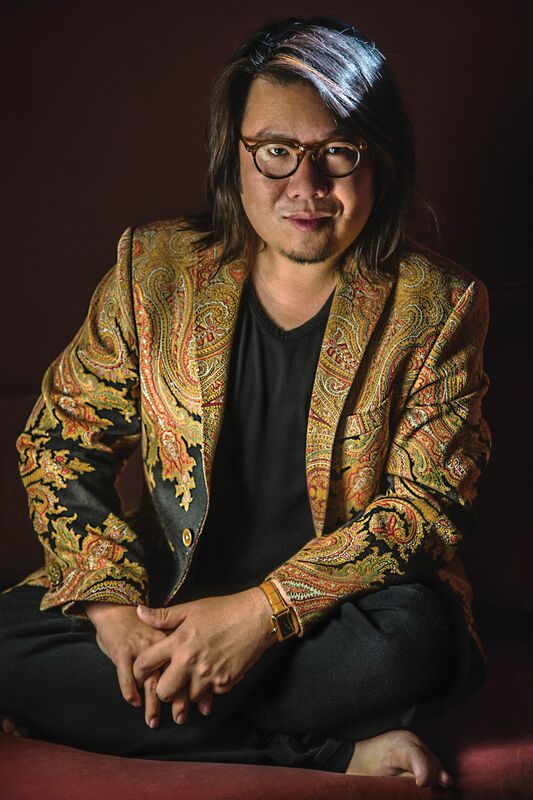 Though only a few of his relatives work in creative industries, there has always been an artistic streak that runs through the Kwan family’s blood. Kevin’s father studied architecture (but ultimately chose to become an engineer) while his mother is an accomplished pianist. His aunt, a fellow writer, wrote for Singapore Tatler in the 1980s. Had he stayed in Singapore, he doubts that he would have had the opportunity to exercise his creativity—perhaps he would have been fated to crunch numbers in a finance post. Writing a novel had always been on Kevin’s bucket list, originally filed under ‘save-it-for-later’ but quickly migrated to ‘do-it-now’ after his father was diagnosed with cancer in 2009. Kevin would drive him to medical appointments, and their daily conversations would often turn to stories of the not-so-distant past, of a place that was once home, of a colourful cast of characters he wished to memorialise on the printed page. Moving to the United States had a profound effect on how Kevin saw and understood the world he had been privy to. Characters such as Nicholas Young, who had been sent off to boarding school in the United Kingdom (this was a common practice, even in the real world), have an inevitably westernised worldview despite being Asian, something that the author himself can relate to. “My own perspective is that of an outsider looking in,” he affirms. “I was in absolute shock,” he says of the honour he has been accorded by TIME Magazine, which he had learnt of via email just a few days before the announcement was made public. “I was sure they had made a mistake. Or perhaps someone was playing a prank on me. But a couple of days later, it was on newsstands, with a beautiful essay by Constance Wu—who had managed not to give away anything despite our correspondence just a few days before.” Kevin is humbled by the experience, happy to be sharing the honour with many of his own longtime heroes, as well as grateful for the incredible levels of support he has received from readers all over the world. And there is even more reason to celebrate, for his work has made a successful transition from the printed page to the silver screen. Involved in all creative aspects of the film, he worked closely with director Jon Chu as well as the rest of the cast and crew, scouting for the perfect locations, choosing the appropriate costumes, and even helping train the actors to speak with the right accents. He personally reached out to people he knew to borrow one-of-a-kind jewellery and timepieces—a distinguished collector permitted them the use of an incredibly rare Rolex Paul Newman Panda Daytona worth over half a million dollars—to establish a truly authentic feel.